Green bananas are a staple in Jamaica and other Caribbean nations, as well as in India and parts of Africa. In these countries, the green banana is treated more as a vegetable than a fruit, and it is most often prepared and used in dishes much as Americans use potatoes. 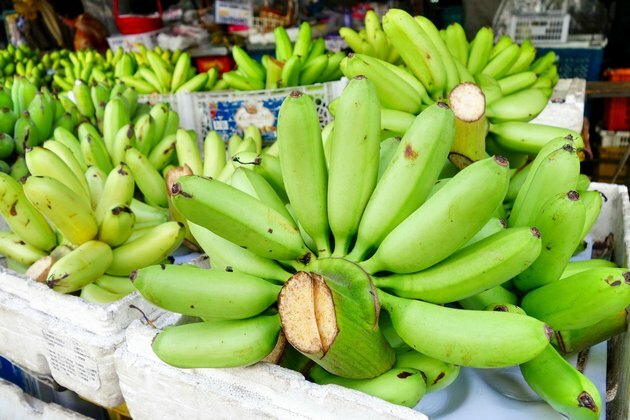 Unlike yellow bananas, green bananas are quite starchy and not very sweet, which makes them a better choice if you are watching your blood sugar. They are good sources of dietary fiber and potassium and generally low in sodium. Boil these starchy bananas with or without their peel. In Jamaica, they are commonly eaten as a side dish for breakfast. Boiling green bananas, as opposed to frying in butter or oil, reduces the amount of fat you would be taking in. Place the whole, unpeeled green bananas into the boiling water. Allow them to boil for 20 minutes or until they are soft enough to be easily pierced with a fork. Remove the bananas from the boiling water. Use the paring knife to make a lengthwise slit into the banana peel. Remove the peel from each banana. Serve as a side dish with fish or pork meals. Boil the bananas with their peel removed as an alternative cooking technique. The peels of green bananas are harder to remove before cooking, but they can also be boiled unpeeled. Use the paring knife to cut off both ends of each banana. Make several cuts into the peel lengthwise along each banana and peel away the skin in sections. Once peeled, boil the green bananas as in Step 2. The boiled green bananas are a stand-alone side dish in Jamaica, but they can also be used in other recipes. Slice or mash them and add Caribbean seasonings and lime juice to toss in a cold salad, or mix them with potatoes and curry powder to make a hot Jamaican potato salad. Mashed boiled green bananas also form the basis for a popular Jamaican porridge made with coconut milk.